Violet's vintage-influenced mic is beautifully made and an excellent choice for vocals and close miking. Excellent up-front sound. Quality design and finish. Compact shock mount. Violet Design makes some of the best large diaphragm mics you can buy. On the whole these are pretty keenly priced, although being European-made they're not as cheap as products made in the Far East. The Flamingo Junior offers an interesting feature combination. Packaged in a compact lollipop design, initially it looks similar to the now discontinued Dolly microphone. However, in pedigree it's far closer to Violet's top-of-the-range Flamingo tube, and the £750 price tag confirms this. The capsule is Violet's 'standard' VD26 unit (also found in the Amethyst Standard mic), and this is mounted using a shock mounted capsule head similar to the one used for the top-flight Globe. The fully discrete class-A electronics are complemented by a hand-wound transformer output stage, providing additional electronic isolation but also some additional vintage flavour. The package is rounded off with a GSM shock mount. This base-mounted clip combines with the capsule suspension system to offer considerable isolation and is much more discreet than a traditional mount. 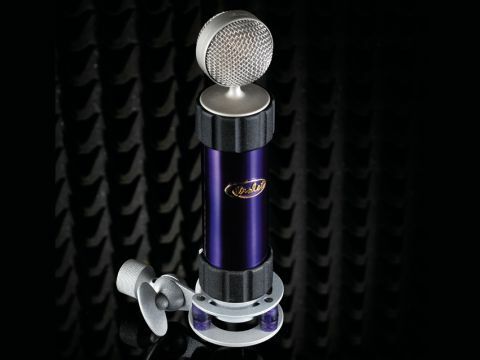 Violet microphones typically deliver class-leading specifications. The Junior has a self-noise figure of 7.5dB (A-weighted) and a reasonable 21mV/Pa sensitivity, making it ideal for a wide range of recording including distant miking. As mentioned the electronics are coupled with the VD26 capsule, which is designed to deliver a vintage sound. In laymen's terms this means the frequency response isn't particularly flat, and has been 'tuned' to enhance the sound. In practice this is only a dB or so here and there, but based on the frequency plot, you can expect to get a slight dip at 700Hz, a presence boost at 2kHz, a slight boost around 50Hz and some extra air around the 12kHz mark with a corresponding overshoot dip at 6.5kHz. In fact, these subtleties wouldn't be unusual settings to apply as EQ in a multitrack setting, particularly for closely miked sources such as vocals, guitars and lead instruments, so you can see where Violet is coming from. So, how does the Flamingo Junior perform in practice? First up, it's worth saying that like all Violet mics there are no level pads or roll-off switches. The GSM mount offers good isolation, but if your preamp has a low-cut filter, all the better. Next, we think the overall finish of this mic should get a special mention. Yes, the colour may not please everyone (a black-bodied version is available), but we've never encountered a mic that's finished any better than this. And the sound? As predicted, the contoured response works great up close, and the mic works particularly well for acoustic guitars and vocals. The proximity isn't overbearing and the dual layer grill certainly helps keep plosives in check, even right up close. Moving on to other sources, the overall brightness works well on percussion sources. We'd also say that the cardioid pick-up pattern is pretty open, but also offers good high frequency rejection round the back - so good news in a tight recording environment. Overall, the Flamingo Junior is at its best on vocals, delivering an up-front and articulate sound with a slightly hyped top end. The only downside is the current exchange rate makes it more expensive for UK customers.